[0:25] <funkster> so what happens if a power supply im using is 5v but can send over 1amps? [0:35] <funkster> so is there a max ams that 5v can do? [2:06] <mukti_> I'm trying to log into my pi, but I don't remember the passwords on any accounts. I booted into single user mode (jumper on pins 5 and 6),but I can't use passwd to change the root password. Does anyone know of any other way to reset the root password? [2:12] <shiftplusone> superlou, did you 'sync' before yanking the card out? [2:14] <shiftplusone> mukti_, yup, the safe mode uses an initramfs for root rather than just entering single user mode in the existing partition. You could have added init=/bin/bash to cmdline to achieve it in the first place. [2:25] <madsy_> I don't seem to have any hardware acceleration at all. What could be wrong? [2:26] <shiftplusone> Then you've got other problems. [2:26] <shiftplusone> madsy_, how do you know? [2:26] <shiftplusone> delinquentme, I don't know about 'easiest', they're all fairly easy. Nginx is a popular one. [2:27] <madsy_> shiftplusone: Not even for 2D acceleration? 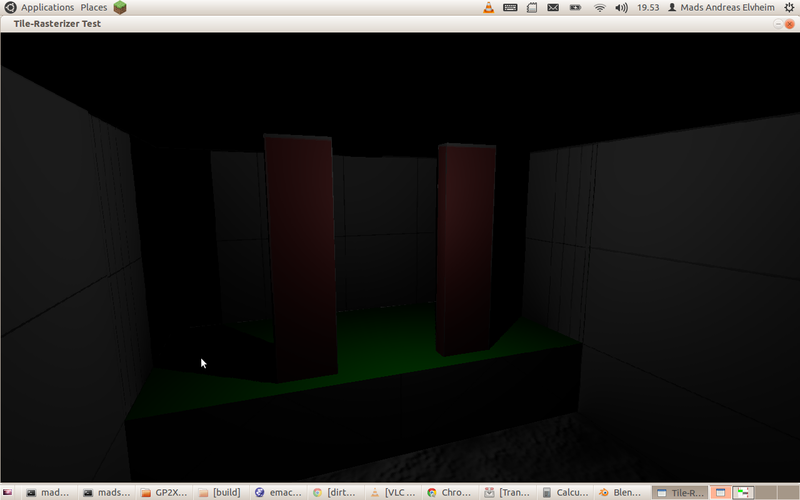 [2:28] <shiftplusone> madsy_, the software would need to know to use opengl es or openvg to take advantage of it. [2:28] <madsy_> shiftplusone: Nah it wouldn't. You have 2D acceleration and 3D acceleration. [2:30] <shiftplusone> I am telling you what the GPU expects. There is no other way to get acceleration from it. Unless you know the VC instruction set and are competent enough to use it. [2:31] <shiftplusone> People have... it just seems that the SDL build you're using hasn't (there may be accelerated builds out there somewhere, I am not sure). [2:57] <shiftplusone> I was mentioning a while back that the pi has some potential for demoscene. Good to see someone doing it. [3:57] <delinquentme> easiest way to hit a URL on a raspberry pi ... and have it execute a python script? [4:18] <RiXtEr> Hey, what should be in line with a switch if I go grnd to gpio 17, a resistor, or will the pi protect itself? [4:18] <delinquentme> sney, PhotoJim wait how can these be used? I've never seen curl execute a script on a remote machine...? [4:19] <RiXtEr> delinquentme, you can use python cgi... most don't recommend it due to security issues, but if you are just using it at home it'd probably be alright. [4:19] <PhotoJim> delinquentme: wget just fetches web content. curl, I am not super familiar with but it does the same, with more complexity. [4:19] <Xark> delinquentme: They just access a URL and download the resultant stream. If the URL connects to a script (php, CGI etc.) it the web server will execute it. [4:20] <delinquentme> Curl will execute a script on a remote machine? [4:20] <Xark> delinquentme: No, the web server will execute it when a specific URL is access (assuming it is set up that way). [4:22] <delinquentme> will this allow script to be executed?! [4:24] <RiXtEr> delinquentme, what is the contents of 'carls_stepper.py' is it something you can pastebin. [4:26] <RiXtEr> delinquentme, the important thing here is that you give the .py a import cgi and some html to tell it to run something in the code. [4:30] <delinquentme> what part is telling the server to execute the python script instead of serve it up as text ? [4:31] <RiXtEr> if you are using the python -m CGIHTTPServer, then it will pick it up from the directory that is executed form. [4:31] <RiXtEr> does it have 755 permissions? [4:32] <RiXtEr> and given it some html to serve out. [4:33] <RiXtEr> update your pastebin. [4:34] <RiXtEr> it should be giving you access logs. [4:41] <RiXtEr> delinquentme, that do it? [4:47] <Jeebiss> Bozza: are you around by any chance? [4:48] <RiXtEr> and it works! [4:49] <Bozza> Is the switch hooked up to your pi RiXtEr? [4:49] <Bozza> Jeebiss: ahh yes of course. How is it coming along? [4:50] <Jeebiss> First off, im not sure what is being handled differently, and second off, can I adjust the command to accomodate? [4:57] <RiXtEr> I have seen ISP's hijack dns requests sometimes. [5:02] <RiXtEr> it should last until the next time your network is up/down, then it will reset back to what ever dhcp tells it. [5:04] <Jeebiss> Can you breifly explain what changing the nameserver would do RiXtEr ? [5:06] <Bozza> Good to hear it works! [5:07] <Jeebiss> So, I should hook it back up to my ICS connection, and change the nameserver? [5:07] <RiXtEr> just let it work. [5:07] <RiXtEr> if you need it using ICS for some reason, then its something to try. [5:08] <Bozza> Do you not have any wifi routers lying around? [5:08] <Bozza> How is your pi connected? Ethernet? [5:09] <RiXtEr> if it turns out to be the problem, you can make that a permenant solution as well. [5:09] <Bozza> RiXtEr: how would you add a new line onto a file in bash? [5:10] <Bozza> Is there a simple solution to this? [5:10] <RiXtEr> echo hi >> /somefile. [5:15] <RiXtEr> not something I have used much. [5:17] <Bozza> Ahh. So it keeps piping from one command into the next? [5:22] <RiXtEr> python is nice. [5:22] <Bozza> What's a good and easy language in your opinion? [5:27] <sney> it will serve you well. [5:28] <Jeebiss> now try my script? [5:29] <Bozza> RiXtEr: isn't c# a proprietary language that only works with microsofts software? [5:31] <Bozza> RiXtEr: do you use any python web frameworks? [5:31] <RiXtEr> Bozza, not really, I work mainly with cli python stuff. [5:34] <Bozza> No way !!!!???? [5:34] <Jeebiss> RiXtEr: Any ideas on what else ICS may be doing to affect this? [5:35] <RiXtEr> Jeebiss, not right off... what does ping google.com look like? [5:35] <Jeebiss> want to actual output? [5:35] <Bozza> Jeebiss: did changing the dns help? [5:35] <RiXtEr> doesn't just sit there tryint to resolv? [5:36] <RiXtEr> what about response times are they high? [5:36] <Bozza> RiXtEr: if you use gtk can you make a python app that will compile? [5:36] <RiXtEr> Bozza, I think so. [5:36] <RiXtEr> how does the same thing look on your laptop? [5:37] <RiXtEr> Jeebiss, pastebin your code if you dont mind. [5:40] <Bozza> RiXtEr: wow awesome.. I think you just solved my GUI issues I was having with py!!! Thanks!!! [5:41] <RiXtEr> Jeebiss, so this records a voice clip (out.flac) then does a post to google and checks the results? [5:44] <RiXtEr> Jeebiss, so hwat output do you see when you run this? [5:45] <RiXtEr> Jeebiss, it could be the way that ICS is doing the 'NAT' or the firewall settings in windows. [5:47] <Jeebiss> Connecting to www.google.com (www.google.com)|74.125.227.114|:80... connected. [5:48] <RiXtEr> Jeebiss, that is the beauty of nat. [5:49] <Jeebiss> Think there is anythign i can do? [5:50] <Jeebiss> What would be a relevant port? [5:52] <Bozza> All hooked up to the pis GPIO? [5:52] <RiXtEr> Bozza, even better, the temp sensors only use the '1 wire' I2C pin. [5:52] <RiXtEr> all 3 on one pin. [5:53] <Bozza> Oh wow. That's cool! Do they go straight to the pin or did you need some rs322whatver > i2c converter? [5:54] <RiXtEr> straight to the pin. [5:54] <RiXtEr> just had to load the i2c module in linux and bam.. temps were coming in. [5:59] <Bozza> Does the HTML just auto refresh to get live temperatures? [5:59] <RiXtEr> I have been writing a python script to control my furnace/ac, but I don't fully trust it enough to hook up to my unit yet. [6:00] <RiXtEr> it updates temps every 30 secons. [6:00] <Bozza> Some evil cat could get codes into your mainframe and make you sweat! [6:05] <Bozza> Hahah do you mean the cat clip? [6:09] <RiXtEr> 4 files... the temps.txt is generated by the readsensors-looping.py file. [6:13] <Jeebiss> Any suggestions on a decent cheap dongle? [6:13] <Jeebiss> How can I know if it will work on the pi? [6:14] <RiXtEr> that is the hvac one I have been working on. [6:23] * RiXtEr wanders to bed. [7:50] <pkh> is there a 'correct' way to selectively power a usb device using the rpi? can I route the +5v pin to somewhere on the rpi to selectively give it power? [7:51] <pkh> shiftplusone: are we talking about the electronics equivalent to a relay? [7:51] <pkh> if so, do you ahve a keyword or model that I could use as a starting point on google? [7:52] <shiftplusone> it will look similar to a motor drive circuit. [7:53] <shiftplusone> except you use 5v for the motor voltage, replace the motor with the usb device's 5v pin and you don't need the flyback diode. [7:54] <shiftplusone> though the voltage drop across the transistor will be an issue. [8:05] <j4jackj> For some strange reason, I want to set up a hybrid wired-wireless mesh network that although it has no access to the internet (by policy), can be patched into other meshes by the Internet, in a similar fashion to radio hams' autopatches between two repeaters (rare but happens). [8:32] <beepie> there an official doc for firmware upgrades? [8:35] <beepie> berzerka, can i ask in here? [8:35] <beepie> berzerka, would you happen to know about raspberry firmware updates? [8:35] <berzerka> beepie, what distro are you using? [8:36] <beepie> berzerka, it's raspberry's official..
[8:36] <shiftplusone> beepie, there's nothing special that you need to do. You keep the firmware up to date the same way you keep the rest of the software up to date. [8:36] <berzerka> raspian, it's called. [8:37] <beepie> shiftplusone, that implies? [8:37] <shiftplusone> beepie, nothing... apt-get update && apt-get upgrade and you're done. [8:37] <beepie> shiftplusone, that's not firmware. [8:37] <shiftplusone> beepie, want to bet? [8:39] <berzerka> what is rpi-update? [8:40] <berzerka> shiftplusone, i see, thanks. [8:40] <shiftplusone> berzerka, it was a bit of a hack. Now it's only useful for testing specific versions of the firmware or running unmaintained distros. [8:40] <JesperHead> anyone here installed retropie on an archlinux-arm build? [8:41] <shiftplusone> JesperHead, maybe give #archlinux-arm a go as well. What's the problem though? [8:42] <berzerka> firmware means specifically bootcode.bin fixup.dat start.elf as well as the /opt/vc libs? [8:42] <shiftplusone> berzerka, I think they may be in different packages, but rpi-update does everything... kernel, modules /opt/vc stuff and the actual firmware files. [8:43] <shiftplusone> I thought it was just an hdmi thing. [8:43] <berzerka> shiftplusone, ok.. since that's what i copied by hand for "updated firmware" (the next branch) when trying newer kernels. [8:44] <shiftplusone> berzerka, if you're going to use the next branch, rpi-update is actualy handy. Check the repos first though, I think there may be a 'next' firmware package there as well. [8:45] <berzerka> shiftplusone, yes, that's the one i used. checked out via git and copied the files mentioned above over. [8:45] <berzerka> shiftplusone, seems to work just fine, wanted to know wether i am missing something anyways..
[8:46] <berzerka> ah you mean a package. sorry it's early in the morning. [8:46] <shiftplusone> and yes, I did mean a deb package in the actual repos, not on github. [8:46] <berzerka> shiftplusone, you mean kernel modules not matching the modules' firmware in /lib/firmware? [8:46] <JesperHead> "make: *** [gfx/context/vc_egl_ctx.o] Error 1 ==> ERROR: a failure occurred in build(). Aborting..."
[8:47] <berzerka> shiftplusone, in which way do (i suppose kernel) modules depend on the firmware files? [8:49] <shiftplusone> The firmware is still under development, so the way you talk to it may chance slightly and if that's not reflected in the userland, you may run into trouble. [8:49] <shiftplusone> I have seen an error actually complaining about the mismatch, but I don't remember where. [10:28] <InterWeb> How do I can make an irc server on my raspbian ? [10:40] <shiftplusone> InterWeb, Use Google to find a server, install it, read the documentation. [10:41] <Vostok> in what situations could sshd stop working with the machine still responding to ping? [10:41] <shiftplusone> Then google using whatever language you're most comfortable with and use those resources. [10:42] <shiftplusone> Vostok, someone reported that their http server was working fine, but ssh would not respond as well. Did you mess with the kernel or firmware by any chance? [10:43] <shiftplusone> InterWeb, Just wondering, which language? [10:43] <shiftplusone> ah damn, the one language I don't know. [10:44] <Vostok> if the script is stuck somehow, can it make sshd and apache stop working? [10:44] <InterWeb> shiftplusone, Is ircd-hybird good to use ? [10:44] <th0rsten> anyone here has cross compiled opencv for the raspberry pi and can give me some pointers? [10:45] <shiftplusone> Vostok, have you checked your tp1-tp2 voltage? [10:45] <shiftplusone> InterWeb, I don't have any experience personally. [13:30] <LordThumper> Hi all. What kernel branch should I use 3.6.y or 3.11.y? [13:30] <LordThumper> Trying to build a distro. [13:31] <BCMM> LordThumper: how are you building the distro? [13:31] <BCMM> i mean, LFS-style or with some sort of tool? [13:31] <berzerka> LordThumper, i tried running 3.11.y over the weekend and had problems with the smsc95xx driver crashing. 3.6 and 3.8 went fine. ymmv. [14:21] <FR^2> Jck_True: un-drop it! [14:21] <Jck_True> unpopsicle: Oh really! Damm wish I had known that earlier! [15:10] <Sonny_Jim> can anyone suggest a chip I can use as a buffer/protection for the GPIO pins? [15:34] <Sonny_Jim> Am I right in thinking I should be able to drive 74HCT chips straight from the GPIO pins? [15:58] <Sonny_Jim> davor: So what is the question? [16:04] <MrVector> Hmm, random C question, is it possible to declare a struct that allows you to access a byte in two different ways for example a bitfield struct and an uint? [16:06] <MrVector> Been trying to Google but not found anything that covered the above. [16:13] <jerng> MrVector: two functions with this type of struct as argument , which do the desired operations? [16:16] <zap0> where do i find info about the GPIO ? [16:17] <zap0> what do they do? are some analog? [16:17] <zap0> do any have special functions? [17:11] <Sonny_Jim> Am I right in thinking I can drive HCT logic straight from the GPIO (3.3v) without having to use a level convertor? [18:16] <gordonDrogon> 595 is easy..
[18:59] <gordonDrogon> 2^8 is only 256. [18:59] <gordonDrogon> I've done 128 with a Pi in the past. [19:00] <gordonDrogon> that's with a pair of mcp23017 GPIO expanders - and a multiplexed 8x8x2 matrix. [19:17] <IT_Sean> Nope. noone here. [19:20] <Sonny_Jim> rihnapstor: That was sarcasm btw, what's your question? [19:37] <SrRaven> anyone have a good tip on a pi case that is camera compatable? [19:39] <SrRaven> If you can modify a standard plastic case with a chisel and an hammer ill buy you a car. [19:40] <IT_Sean> SrRaven: A new car. [19:40] <honkeygenius> hah get ready to pay up because you can modify a case with those tools, just that the result won't be of much use. [19:40] <IT_Sean> Specifically, BMW 135 coupe. Black over tan. Manual gearbox, and all the fruit. [19:50] <SrRaven> any advice ? [19:55] <SrRaven> as a noob,what does that do? [19:56] <mwlang> How much of a difference does the SDHC card's class rating make in overall performance of the RPi? I'm trying to decide between Class 4, 6, and 10 ratings. [19:58] <PhotoJim> ozzzy: I see a big difference in doing system updates. actually running, not really too much. [19:58] <PhotoJim> unless a Class 4 or 6 were massively cheaper and speed wasn't that important, I'd pay for a 10. [19:58] <PhotoJim> but aside from the updates, I can't really see much of a difference. [19:58] <PhotoJim> Sonny_Jim: only if you have the video on the SD card. I network stream everything. [19:59] <mwlang> I'm running a web app on my RPi, and its the boot up times that are killin' me….once its up and running, it runs responsively. [19:59] <mwlang> so I was thinking to buy a class 10 as the solution to that. [20:00] <mwlang> ozzzy: somewhat frequently because I'm actively developing the web app and testing it. [20:00] <Sonny_Jim> You reboot to test? [20:00] <mwlang> Sonny_Jim: the web server, not the OS. [20:01] <mwlang> I should say *bounce* the web app, I reckon. [20:01] <Sonny_Jim> I take it you are using apache? [20:02] <rihnapstor> guys i want to build a home automation server.the functionality will be controlled by voice command and for remote handling i plan to expose the API through a web service. my question ..is one node enough to perform the task? [20:02] <rihnapstor> i plan to write web service in python. [20:03] <mwlang> Sonny_Jim: I'm doing both. [20:05] <mwlang> Its ok…I'm on a class 4 SDHC card right now and PhotoJim's comment about big difference in speed during system updates convinces me to buy a class 10 -- I'm just going to double check the bus is capable of clocking at 10's speeds. [20:05] <rihnapstor> will a single pi node crash when multiple users are monitoring the activity ? [20:06] <Sonny_Jim> rihnapstor: What's the CPU load? [20:06] <mwlang> rihnapstor: for a python app? [20:07] <rihnapstor> no Sonny_Jim mwlang in general i am asking is single pi node bare atmost less that 10 users ? [20:08] <mwlang> rihnapstor: I'm running a Ruby app as a web app with Puma -- Only one user at a time can connect when I have a blocking connection underway, but I briefly tested with nginx fronting the app and that took care of the multi-user problem for me. Python runs a good deal faster than Ruby with a smaller footprint, I believe. [20:09] <mwlang> so, basically, as long as the CPU and RAM aren't maxed out, you should be able to handle things with one node. [20:10] <mwlang> is it just me or is there an echo in the room. [20:12] <mwlang> Sonny_Jim: eh? I was referring to same answers directed at rihnapstor's questions -- my questions were answered satisfactorily. [20:12] <rihnapstor> Sonny_Jim: mwlang: great:) my app will consume the web service that will be available on the pi. (the fucntionality is toggling home appliances remotely). only one user at a time should be granted access for controlling appliances remotely,but at the same time other users will automatically fall back to read only mode. [20:15] <mwlang> rihnapstor: yes. Are python apps single-processes only? If so, you'll need to run behind nginx or apache or lighthttpd to have multiple runners to handle multiple concurrent requests. [20:16] <mwlang> I'm not a python expert as I switched to Ruby years ago. [20:16] <Sonny_Jim> rihnapstor: Because I've learned that you try to help people and they get the ar*e with you. [20:18] <mwlang> Sonny_Jim: nothing but thanks from me. If I upset you, apologies. [20:18] <rihnapstor> mwlang: ok got it..
[20:19] <rihnapstor> mwlang: can i get your app link ? [20:20] <mwlang> rihnapstor: Its not published. I'm just tinkering and exploring with the RPi. [20:23] <rihnapstor> Sonny_Jim: whats ar*e ? [20:25] <rihnapstor> mwlang: how do most folks push code to pi ? my idea is first commit the changessets to github, and then from there clone the code on pi.what you suggest ? [20:26] <mwlang> Well, well, well… not all class 10 SDHC cards are created equal: http://elinux.org/RPi_SD_cards#Performance is specific to RPi and looks like a good resource all in all. The *best* Class 10 looks to be around 3 to 4 times faster than many of the Class 4's. [20:27] <mwlang> I don't push to github, though…just have a local gitolite server running and push/pull from there. [20:27] <mwlang> and since I'm using Ruby, I use capistrano for deploying. [20:29] <mwlang> gitolite isn't strictly necessary -- just makes is a lot easier to set up and host a "git server"
[20:31] <chaoshax> My uni decided to make us use them, even nano was laggy. [20:33] <chaoshax> So does multiwii airplane mode work well? [20:33] <patagonicus> And I can't remember having problems with vim, so nano shouldn't lag too much. [20:36] <chaoshax> But I want it to be clean. [20:37] <chaoshax> Not a mess of wires. [20:42] <local> hey all. Would you suggest to run nginx on a RaspberryPi with PHP5-FPM oder with FastCGI ? What will be better performance? [20:48] <sney> that is typically how it goes. YMMV. [20:48] <sney> I'm sure google can show you some graphs if that's what you're looking for. [20:50] <sney> local: the truth is it probably won't make a practical difference in your case. [20:51] <sney> same as switching between lighttpd/apache/nginx won't really either. [21:19] <SrRaven> dumb question but can I connect a pi directly to a pc ? [21:19] <SrRaven> to configure it ? [21:20] <IT_Sean> you mean, via SSH, over a network? [21:20] <IT_Sean> you would typically need a router or switch in there. [21:20] <IT_Sean> in order to get the raspi an IP you could SSH it. [21:22] <pksato> SrRaven: You can connect rpi to pc direct using ethernet cable. [21:22] <pksato> but, need to configure both manualy. [21:31] <pksato> RPi is a work project? [21:34] <pksato> or use serial console . [21:49] <funkster> anyone power RPi off a usb wall outlet? seems like its 5v 2.1 AMPS shared between two ports. is this OKAY to use? [21:52] <Encrypt> funkster, Sure it is! [21:52] <Encrypt> The RPi won't ever consume more than 700mA. [21:53] <funkster> Encrypt: i ask because i will use one port for RPi and the other port to charge phone, and it will be shared, so i guess the amps will fluctuate at times, all good tho?